Uncle Harry’s Toothpaste was formulated by Uncle Harry following a period of painful and acute gum infection. When conventional dental procedures failed to reverse his symptoms, Harry turned to ancient herbal medicine. The result is an all natural toothpaste based on centuries of ancient wisdom which not only helps to cure but also avoid oral health problems (view on Amazon). Today’s toothpastes have a lot of boxes to tick. Obviously we expect them to clean our teeth and brighten our smile. But they also need to do this without damaging our teeth and, on top of that, work to protect and strengthen them. As if that’s not enough, they have to taste good too, and prevent bad breath. Moreover, many studies reveal a close link between gum infection and cardiac and cardiovascular disease. So toothpaste does matter. But as a universal product, companies know there’s big money to be made from toothpaste. Because of this, there are literally hundreds of toothpastes available, and a minefield of competing claims for their effectiveness. So how do you know where to start? This Uncle Harry’s toothpaste review will help provide general guidance and help you decide if it is right for you. A good toothpaste must remove plaque and lift stains. Teeth naturally lose minerals each day and need to be able to absorb minerals (remineralise) from saliva and toothpaste products. This helps to protect them from decay. To aid with these processes most toothpastes contain abrasives and mineral products. To disguise the taste of these ingredients and freshen breath, flavouring is added. *That is provide you with an enjoyable experience that you will want to take part in, not see as a chore. This could include elements such as taste, texture, design, etc. Relative Dentin Abrasivity Not available but the principle ingredient (bentonite clay) scores between 1 and 2 on the Mohs hardness scale which is very soft. Makes you want to use it? Plastic free packaging – the container is glass, natural ingredients, squeaky clean feel after brushing. Compared to ADA criteria, Uncle Harry’s may seem to fall short. However, it’s important to remember that this is a product that relies on long established natural ingredients to do its job, rather than modern chemicals. If you are reading this article then presumably this matters to you, so read on to find out how Uncle Harry’s toothpaste could become an effective part of your daily oral health routine. Texture can also seem odd compared to regular toothpaste. Uncle Harry’s Toothpaste is targeted at people who wish to use an all natural product which is free from modern ingredients commonly found in conventional toothpaste which have been found to be potentially damaging. It does a good job of cleaning teeth, brightening your smile, freshening your breath and protecting your teeth and gums. It does this using traditional natural ingredients with a long history in oral care. Once you have become used to its taste and texture you could become one of Uncle Harry’s many devotees. The only potential deal breaker is cost, though the product is used far more sparingly than toothpaste and multi packs are available to reduce costs. Uncle Harry’s is designed to target all your oral health needs, though it is not marketed as a whitening toothpaste (view details). Its principle ingredient is bentonite clay. The great thing about the clay is that it’s effective at lifting stains and cleaning teeth, but gentle enough not to damage the enamel. 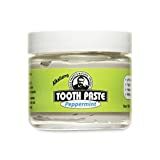 In addition, bentonite clay rich in minerals which can easily be taken up by your teeth, partly because Uncle Harry’s does not contain glycerin – a common ingredient in modern toothpastes. Glycerin is thought to coat teeth and prevent them from absorbing the minerals naturally contained in saliva as well as toothpaste products. Teeth lose minerals every day so they need to be able to take up these minerals freely – Uncle Harry’s enables this. Lastly, combined with other natural ingredients Uncle Harry’s helps to reduce the bacteria load in your mouth and neutralises harmful bacterial acids, helping to fight plaque build up and decay from acid attack. 2.) Will Uncle Harry’s Toothpaste damage my teeth? No. The clay in Uncle Harry’s which is the ingredient that lifts stains and cleans your teeth scores between 1 and 2 on the Mohs hardness scale which is very soft. It compares favourably with silica, a common abrasive used in conventional toothpastes, which scores 7 out of 10. 3.) Does Uncle Harry’s Toothpaste protect your teeth? Uncle Harry’s does not contain fluoride. This could be a bad thing or a good thing depending on your point of view. The ADA insist that a good toothpaste should contain fluoride and will not accredit toothpastes without it. On the other hand, there are some health concerns around the use of fluoride. The clay in Uncle Harry’s is rich in the minerals that teeth need to replenish themselves, such as calcium, and the absence of glycerin means these minerals are easily taken up by your teeth. The product itself helps to maintain a neutral ph value in your mouth, protecting your teeth from acid attack. 4.) How does Uncle Harry’s taste? Here is the potential fly in the ointment. There are four flavors available (spearmint, peppermint, cinnamon and anise), but the words ‘salty’ and ‘strong’ appear in many reviews regardless of flavour, though most users love it once they get used to it! The most popular is size and flavour combination is the 3oz peppermint flavour jar. This product is suitable for anyone who wants an environmentally friendly all natural product that is vegan and free from fluoride and gluten. The taste is strong and although Uncle Harry’s provides a children’s version, it is still quite strong in flavour. In addition, bentonite does contain naturally occurring trace minerals and these can include lead. If you are looking for a milder flavoured adult product consider The Dirt! And for kids, a great fluoride free product is Hello. The most popular Uncle Harry’s flavour and size combination is the 3oz peppermint flavour jar but savings can be made on the 4x3oz multipack in Peppermint flavour. Bentonite clay, calcium carbonate, Purified, deionized, microfiltered water and ten parts per million of silver mineral (99.000% pure), sea salt, ionic minerals, mustard seed, essential oils of spearmint, peppermint, eucalyptus, clove, wintergreen, and oregano. Uncle Harry’s toothpaste, and wider oral health range, makes use of all natural ingredients with a long established history of effectiveness. The toothpaste has a refreshing but strong flavour and supports remineralization of tooth enamel whilst maintaining your mouth’s natural ph value. It is gluten free, glycerin free, fluoride free, and vegan. Is the product cruelty free? Uncle Harry’s claims to be friendly towards all the creatures on the planet. What is the difference between this toothpaste and tooth powder? This product is more similar to toothpaste in a tube than toothpowder. It does have a wet mud like consistency but it’s easier to get onto the brush than tooth powder. Is the jar made of plastic or glass? Is it hygenic to keep dipping your toothbrush in the jar? The ingredients in this toothpaste should make this completely sanitary as they are naturally antibacterial. If you are sharing the product you may prefer to transfer the product onto a clean teaspon first. Does the spearmint flavour have a true spearmint taste? It contains oils of spearmint, peppermint, eucalyptus, clove, wintergreen & oregano so the flavour is a combination of different things, but the spearmint does predominate. Is it safe to use on crowns and veneers? Yes, but if you have any doubts consult your dentist.